Onion Tart recipe - 'Tarte a l'ognion' 'Tarta de Cebollas' is a great Mediterranean recipe and we've made our own version for you. It's so versatile: great as an individual starter, or sliced as a light lunch with a crisp salad. Wonderfull picnic fare and even good warmed up at supper time. The secret is to cook the onion mix really well, until it's brown and caramelised, rich and full of flavour. 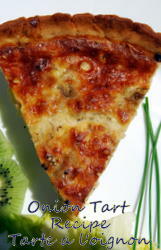 Our onion tart recipe is easy to prepare and cook and the results are fantastic. Make up one recipe of Pam's famous, crumbly shortcrust pastry, or use a good quality store bought pastry. This recipe will make one large 10"/24cm. onion tart recipe or six individual 4"/10cm tarts (see photo below). Right - roll out the pastry and line a 10 inch quiche dish, or 6 individual 4" dishes, making sure that the pastry on the sides is about 1/2 inch above the rim of your dish (this allows for shrinkage during baking). Line the pastry case/cases with the greaseproof paper and fill with ceramic pie weights or baking beans, evenly spread out over the whole surface. Remove the grease proof paper and pie weights/beans and return to oven for a further 15 mins for a large quiche, 10-12 minutes for the small ones. The pastry should be a pale golden brown. Heat the olive oil in a large non-stick fry pan and add the sliced onions and sugar (the sugar will help the onion to brown and caramelize). Cook over a medium heat, stirring all of the time, until the onion starts to colour. Add the garlic and continue stirring until the mixture is golden brown. Crumble in the stock cube, and add the mixed herbs. Then - take it off the heat and allow to cool. In a bowl beat the eggs well and add the milk/cream mixture, cayenne, black pepper, and salt. Beat again until evenly mixed. Take the cooled pastry case, which has been placed on a baking sheet, and spread the onion mixture over the base....or just divide the mixture evenly between the individuals. Sprinkle the grated cheese on top, and carefully pour in the egg and milk mixture. Again, with the individuals, just divide the cheese and the egg mix between then evenly. Bake on the middle shelf of a pre heated oven at 400f / 200c for 25/30 minutes until the top of the tart/s is golden brown and firm to the touch. The individuals will take slightly less time. Serve hot or warm. Great with our tomato salsa recipe.